It feels like the Seventies again. 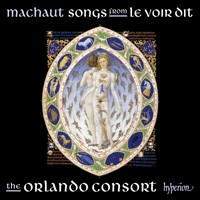 Hyperion has apparently committed itself to a complete set of Machaut’s music. Not just that, but it has chosen the Orlando Consort as its artists. To my ears, this is a dream team, with the enormously experienced Donald Greig and Angus Smith alongside two younger singers on the higher voices – Matthew Venner and Mark Dobell, who display the most magnificent articulation of the texts alongside the understanding of the lines gained from their senior colleagues. But it doesn’t end there: they are working alongside the editors of the first coherent and scholarly attempt at a Machaut edition since the 1950s. Those who know the Orlando Consort will know what to expect. No instruments, just solo men’s voices, singing text where there is text in the manuscripts, vocalising where there is none, always dead in tune, always beautifully balanced. No embellishment or interpolations. No gimmicks to make it easily palatable, though an imaginative juxtaposition of the pieces. Absolutely complete texts in all cases, which seems mandatory because Machaut is as famous as a poet as he is as a composer and also because he is one of the very few composers of those years for whom we know that we have the complete poems in all cases. But the unforgettable track here is Angus Smith performing the ‘Lay de Bon Esperance’, over 20 minutes of unaccompanied solo singing. This and Machaut’s other lais must be among the greatest challenges before Wagner for any singer. He’s terrific.